On the weekend down in Canterbury, apart from the horrific earthquake, there was an extremely unusual dolphin stranding. A 1.8m male Hourglass dolphin came ashore at Flea Bay. Only a handful of complete specimens of this species have ever been dissected before. Although they are sometimes seen in the Southern Ocean around Antarctica, they very rarely strand. 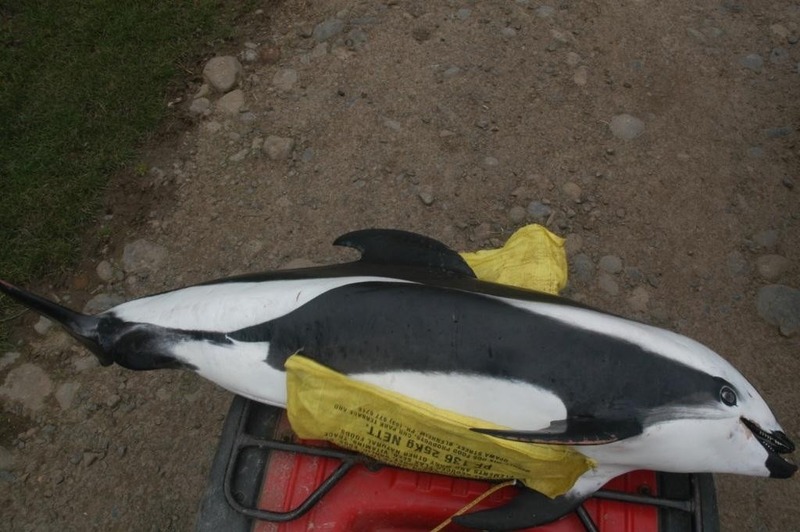 Rare Hourglass dolphin found dead at Flea Bay in Canterbury. Photo reproduced courtesy of Department of Conservation. There is only one other record from New Zealand and that is also from the Canterbury region. This very distinctive black and white animal has colour markings on it like an hourglass, and hence it’s common name. There is some dispute genetically about where it sits in relation to other dolphins, it currently sits in the genus Lagenorhynchus like our commonly seen Dusky dolphin, however there is some suggestion that it may be more closely aligned to the genus Cephalorhynchus like the New Zealand Hector’s (and Maui’s) dolphin. Hourglass dolphin. Photo reproduced courtesy of Department of Conservation. Through the remarkable recovery of the specimen by Derek Cox of the Department of Conservation and the agreement of the local Runanga (Ngāi Tahu), it has been sent in a fresh state up to Massey University Albany campus in Auckland. Karen Stockin realised it was this rare species of dolphin and alerted other scientists around the country. Anton van Helden Te Papa’s collection manager of Marine Mammals, will fly up to Auckland tomorrow to assist with the necropsy of the animal. These animals are so rare, that scientists are pooling their expertise to try and learn as much about the specimen as they can. I was wondering if there was any photos or a video from this necropsy that are available. Even a research paper on the findings would be interesting. Awe, looks so pretty. These are my favorite dolphins of all of them! Poor baby, I would love to see one alive! Thanks Craig, Anton van Helden once said that you could be walking in the beach and discover a completely new species of whale or dolphin…that’s how little we know of them. You did the right thing by calling DoC, and yes, it’s always a pretty sad sight. We (Myself, my wife and two boy’s) came across this last Saturday on the beach in Flea Bay. We had no idea how significant this was, just felt a bit sad to see a dead dolphin on the beach. Got a couple of pictures on the cellphone. Called DoC when were in Akaroa, but no answer, so left it at that. @Sky and Rosiena – I feel the same way and I know that our scientists would much rather be studying these dolphins in the wild. 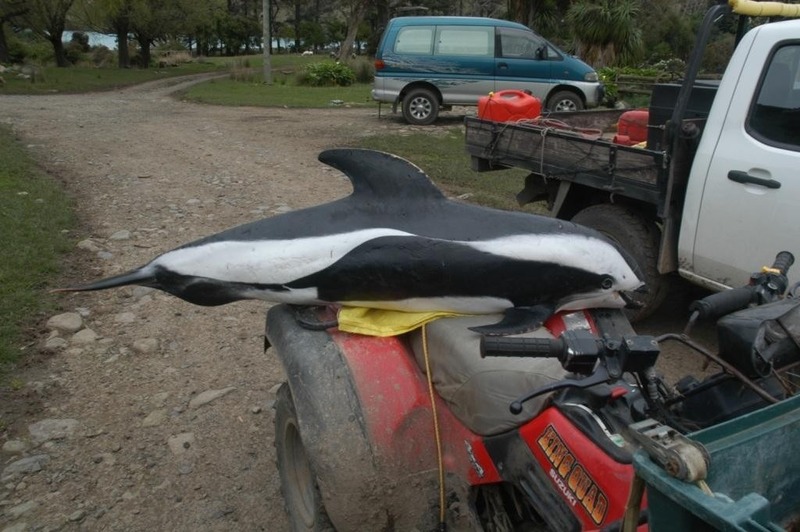 NZ has been called the “Land of Strandings” and we have many stranding events every year. Sometimes the animals can be refloated but often they occur on remote beaches where the public rarely go. @Levi – regrettably we can’t preserve specimens like this one to put on display, but we can commission a model! @Smivs – HI! Great to see you’re still following our blog post-squid. And yes, the scientists hope that the necropsy will help to define its classification. I really hope you guys preserve it as well, are there any plans afoot to have it on display someday, I’d love to bring the children down to see it! What a beautiful looking mammal. would really like to see it up close. What else is under the sea that we have little knowledge about. Feel very sad to see that dolphin like that. Thanks Levi…very exciting for scientists around the world. Of course, we would much rather study these animals in their natural habitat! But this opportunity has arisen and will provide invaluable insights in this particular dolphin’s biology. I will be adding in some links to the blog tomorrow, was a bit too excited today! What an amazing looking animal! I’ve never heard or seen of it before! It looks fast!